Join the Mammamiaaa community! How? Simple, participate by organizing a Mammamiaaa meal! Mammamiaaa is one of the projects spearheaded by Matera 2019, European Capital of Culture, and is part of the “Roots and Routes” theme. preserve, and consume food in their daily lives. The emphasis is on care, more than consumption. It’s about a connection to a place, and a bridge between the generations. In 2018 and 2019, thousands of meals will be organised across Italy and Europe in a spirit of conviviality. 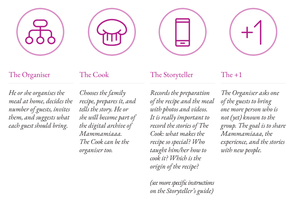 At each meal, family members and guests will share stories about food and cooking. The stories will be collected – in writing, or as a recording or video – and uploaded to social media channels. Read the five rules and share them with your guests. Become social media addicted for one day: each participant is (strongly!) invited to publish on their social channel at least one photo and / or Instagram story of the meal. The social media channel of the project are Facebook and Instagram. The profiles which should be tagged are @mammamiaaa.it and @matera2019. The official hashtags: #mammamiaaa and #matera2019. The lunch or dinner are free. The Cook is responsible for preparing the main dish; the other guests contribute – the wine, bread, cake, fruit, etc. Download the Storyteller Guide from here. For more information, visit the official Mammamiaaa website!